I like you Harpoon, I do. You have some great beers. I just don't think this is one of them. First of all, I'm getting annoyed with this trend of breweries releasing their pumpkin beers well before fall. It's just not right. But I've written about that elsewhere. I had this on tap at Hop Devil Bar in Manhattan. As it's a brand new pumpkin beer, I was contractually obligated to order it. (It's kind of my thing.) The smell was good. The appearance was nice. I took a sip and immediately knew something was wrong here. 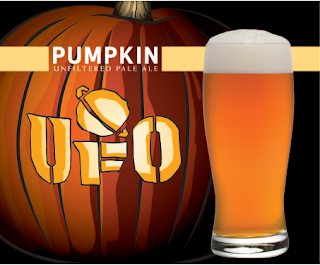 Then it hit me: UFO Pumpkin tastes an awful lot like the terrible Kennebunkport Pumpkin I found at Trader Joe's last year, which used pumpkin flavored syrup to enhance the "pumpkin." Now, I don't know for sure that this is what UFO has done — not having any behind-the-scene's access, I can only guess based on my tastebuds. But in any case, this beer tastes like it was flavored with artificial pumpkin flavor, rather than the usual combo of vegetable matter + spices. And while artificial flavoring is great at achieving a difficult taste that just doesn't want to stick, it leads to that flavor being one-dimensional, overly sweet and blandly sugary. This is why people rarely describe soda as "complex" or write blogs reviewing it. Pumpkin beers should not be treated like fruit beers. In theory, and often in practice, they are much more complex and interesting than that. While this one might taste rewarding at first, it becomes increasingly harder to drink as it warms and the artificial taste begins to grate. Even one of my friends, who liked his sip of mine enough to order his own pint, agreed that it was sickly-sweet after a bit. I noticed that he left an inch or two at the bottom of his glass when we left. **Updated: See below for a nice comment from the creator of this beer. There's no artificial flavoring in this one, just pumpkin and spices. So, well-done for capturing a really strong pumpkin flavor here — I guess I'm just tending to like beers that are less sweet, these days. A well thought out review. Sorry it didn't make the grade for you. Just so you know, there is absolutely no artificial pumpkin flavor. I know because I designed the recipe. Just pumpkin puree and a blend of spices on top of a nice malt bill and German hops. It's going to be out again next year, so I hope you give it another try. Thanks for the comment! It's always nice to hear from someone behind the beer (although now I feel bad.) I'm glad to hear I was wrong, actually, and not really surprised — I just tend not to like sweeter beers, which is a problem I'm having with most pumpkin beers I try nowadays. Also, in that case, you did a good job of actually capturing that pumpkin flavor, since it comes across very clearly. I'll definitely give it another shot next year. Don't feel bad Derek. I appreciate honest feedback. Thanks for noticing the pumpkin flavor coming through. Sometimes it's tough to tell where the gourd stops and the spice begins. I feel that you really need both (and in the right amounts) to complement each other. Cheers! This is an awsome example of a pumpkin ale, definetly top 3 of the 30 or so I've tasted. Another very good pumpkin is Wollavers.